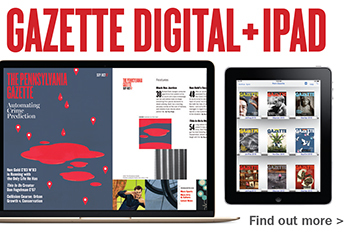 The Pennsylvania Gazette » What Is the Future of the Past? 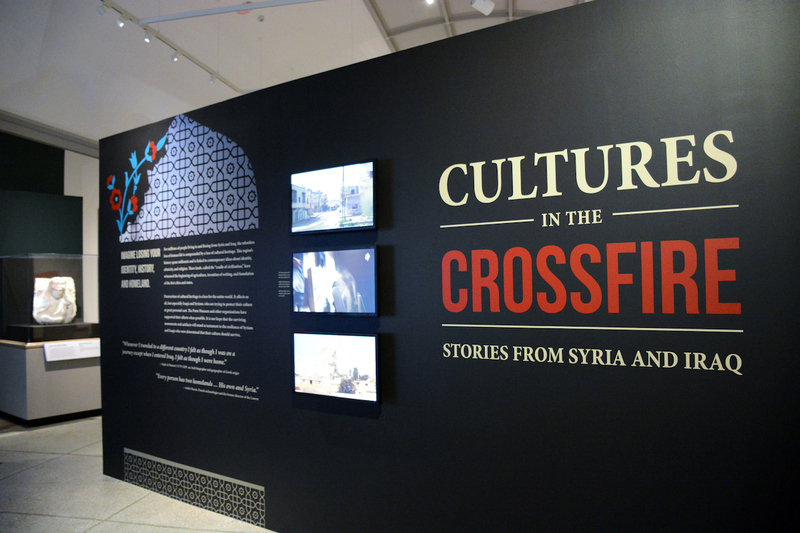 Cultures in the Crossfire: Stories from Syria and Iraq is now on display at the Penn Museum through November 2018. It’s not called the Fertile Crescent for nothing. Ancient Mesopotamia, a region which included most of modern-day Iraq and a large swath of Syria, was the site of a number of firsts for our species. Often referred to as the “cradle of civilization,” the area has played a key role in intellectual developments for more than 5,000 years. Writing was invented here. Mathematics, too. The first wheel rolled down a Sumerian street in 3500 BCE. And way before John Deere manufactured his first tractor, early plows helped cultivate crops like wheat, barley, chickpeas, and lentils in this arid region. 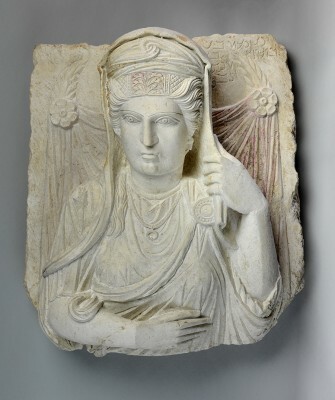 Dating to the 1st and 2nd centuries, funerary portraits like this one demonstrate the complexity and richness of Palmyrene identity. Today, people in the Middle East live and work alongside ancient ruins. They inhabit cities that date back thousands of years. And they value this history because it is part of their cultural heritage. But the rich history and diversity of the Fertile Crescent is at risk. We live in a time when the destruction of cultural heritage has become both a by-product and a tactic of war. Political and economic instability often leads to trashing and looting of archeological sites, harming our ability to understand and reconstruct the ancient past. “It’s one thing to talk about the killing and death of people, which is absolutely outrageous and awful, but we are also talking about the effort to erase people and culture from the face of the earth,” says Richard Leventhal, executive director of the Penn Cultural Heritage Center (PennCHC). Issam Kourbaj’s “Dark Water, Burning World” is among several of stand-alone pieces that serve as an “art intervention” throughout the exhibition. 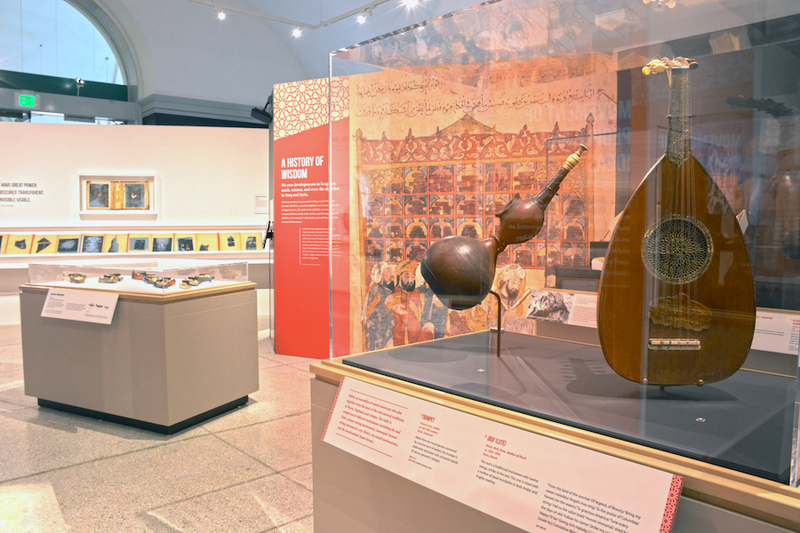 As a response to this atrocity, the Penn Museum opened its newest exhibition, Cultures in the Crossfire: Stories from Syria and Iraq, in collaboration with PennCHC, on April 8. Running through November 2018, the show poses four questions: What is really at stake? Why does it matter? 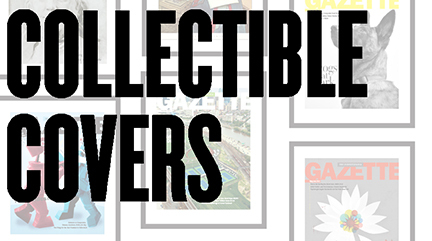 What is the human story that accompanies this unprecedented loss? And what is being done to prevent further loss of material culture, vast human history, and diverse cultural identities? The exhibition juxtaposes more than 50 objects from the Museum’s extensive Near East and Mediterranean collections with contemporary art by Syrian-born artist Issam Kourbaj, who now resides in Cambridge, England. 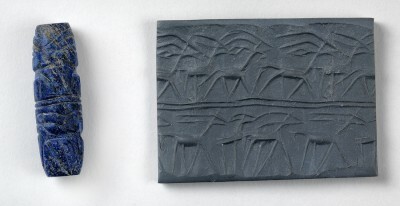 Cylinder seals from roughly 2350 BCE, excavated from tombs in Ur (Iraq), sit next to Kourbaj’s canceled Syrian passport, prodding visitors to consider what homeland means when one can no longer return. The face on a funerary relief from Palmyra (Syria), molded in the 1st and 2nd centuries, stares determinedly below a clothesline of plaster-dipped clothing from child refugees who drowned while crossing the Aegean Sea to Lesbos, Greece. Made of lapis lazuli, which was only found in Badakhshan, Afghanistan, this seal is an example of the far-flung connections of Mesopotamian states that were forged through trade and organized administration circa 2500 BCE. 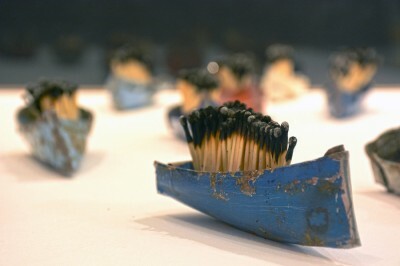 Kourbaj’s “Dark Water, Burning World,” shapes bicycle mudguards into a dozen tiny boats carrying matchsticks, representing vulnerable Syrian refugees. The installation was inspired by the display of 5th-century BCE Syrian sea vessels at the Fitzwater Museum at the University of Cambridge. Another mixed-media piece, titled “Aleppo Soap, Don’t Wash Your Hands,” features a mirror, a broken sink, and a bar of green, olive oil soap. 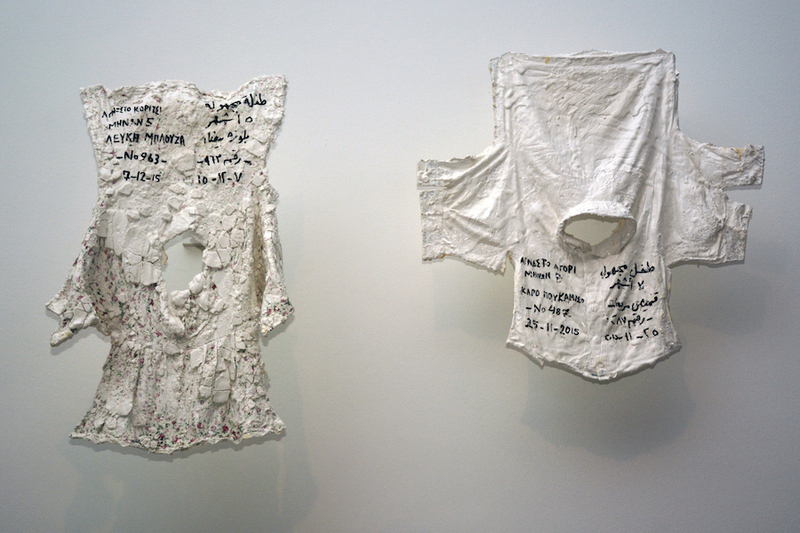 With this reflection, Kourbaj invites guests not to avert their eyes from the current tragedy in the Middle East. A 14th century dictionary from Egypt or Syria covers the letters za’ to lam; while a 19th-century trumpet made from two gourds tied together with leather chronicles the region’s appreciation for the arts. A variety of these musical sounds can be heard at a listening station, and museumgoers can also watch documentary film clips about how the PennCHC is helping to preserve these treasures. A late 19th-century trumpet from Syria, Damascus is made from two gourds connected by a narrow band of leather, elaborately decorated with concentric bands of geometric shapes. Created in 2008 to safeguard cultural heritage across the world, PennCHC trains local communities to protect antiquities and artifacts in their own regions. “We feel communities and people on the ground are critical in identifying heritage and working on the preservation of heritage,” explains Leventhal. In addition, PennCHC works with policymakers to enact laws, such as the Protect and Preserve International Cultural Property Act passed by Congress last year, which attempts to undercut the trafficking of Syrian antiquities by placing restrictions on US imports. Penn has long been invested in the cultural heritage of the Middle East. In 1897, the Museum led its first expedition to Nippur in modern-day Iraq, and it continues active research in the region today. The Museum’s Near East collection consists of some 90,000 artifacts, including some of the most iconic objects from this ancient part of the world. A handful of these artifacts that are not shown in the featured exhibit can be seen in the newly re-opened Artifact Lab: Conservation in Action. Located adjacent to Cultures in the Crossfire, the Artifact Lab offers a behind-the-scenes look at conservators at work. Visitors can see a wide range of artifacts being cleaned, mended, and closely studied; while conservators open their windows twice daily to take questions from guests. Currently, those conservators are concentrating on ancient art and artifacts from the Middle East. In the space outside the lab, guests can view the conservation history of an elegant terracotta “slipper coffin,” from the Museum’s first expedition to Nippur (a “slipper coffin” was created in one piece, so the body of the deceased had to be slid inside). Originally repaired in the 1890s, it was brought to life again in 2004 when conservators re-stabilized old repair materials and reconstructed fragments of the coffin. In a way, that is exactly what Cultures in the Crossfire aims to do: respectfully repair the past so we can appreciate it today and in the future. It also gives ample testimony to the resiliency of the region’s people.